The magic of the Great American Beer Festival may be over, but a few lucky brewers in Lafayette are just beginning to relish in the glory that comes with being a GABF medalist. Lafayette’s Liquid Mechanics has proven that it can compete with the country’s best, making that trek to the East County brewery even more worthwhile. CEO Davin Helden and the Liquid Mechanics team walked away with the brewery’s first GABF win for their “Altbier” in the German-style Altbier catergory, which took the bronze at GABF. The CEO/founder says winning the medal was both a success and a learning process. In addition to securing Altbier as Colorado’s best example in the style, they also made a significant splash with their increasingly popular Peanut Butter Porter. Here is a brief Q&A with Helden about the medal, Peanut Butter Porter, GABF and the competition in general. Q: How did you like GABF this year? A: The new Meet The Brewer pavilion was super cool, the additional convention space made everything seem way less crowded. The thing we kept mentioning to each other is how happy we were at the overall quality and taste of the beers in the convention hall. Craft breweries are really making some delicious beer, and I think we are all helping each other and pushing each other to make a quality product. Lastly, and most importantly, the volunteers at the GABF are some of the best people on planet earth. They are the ones who make each GABF an experience to remember. Q: How does it feel to claim your first win at GABF? A: Absolutely incredible. With somewhere over 6600 beer entries, and breweries bringing their very best entries, the chances of winning anything are extremely slim. The Great American Beer Festival is the Superbowl of beer competitions, and it is a huge deal to take home a medal. Specifically, our medal gave us the right to say that we currently have the best representation of a German Altbier in the state of Colorado. 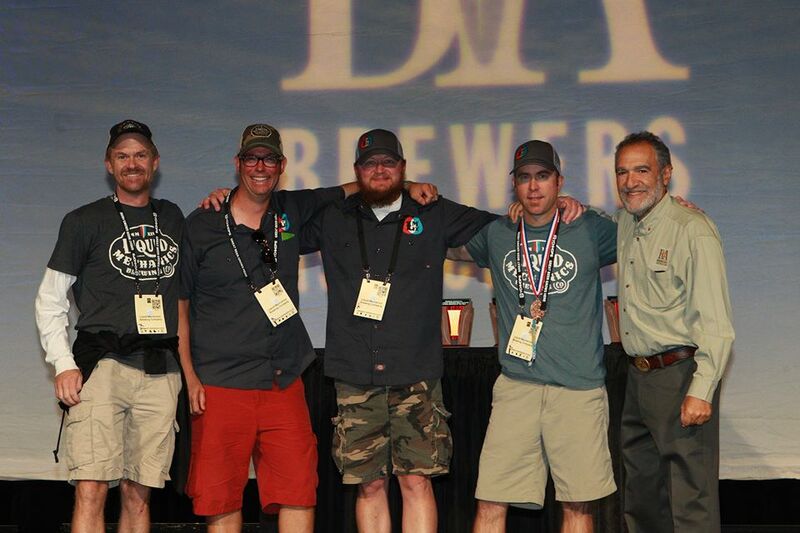 We think that’s fairly impressive for the third youngest Colorado brewery to win a medal. It means we were able to get our stuff together really really quick. More importantly for us though, is that winning any medal at the GABF helps to further establish credibility with the brewing community, our customers, liquor stores, bars, and restaurants. The reason is that once a brewery wins a GABF medal, it proves that there are processes, controls, testing, and quality built into that breweries way of life, and the same level of quality that led to the medal is obviously applied when brewing all of the other beers the brewery produces. At Liquid Mechanics Brewing Co., we perform water testing and chemistry on each different style of beer, rigorously control and monitor our process (temperatures, carbonation, attenuation etc. ), centrifuge samples to perform off flavor/aroma analyses, and use fresh-pitch yeast specific to each and every beer style (rather than having 1 or 2 house yeast strains). Most importantly, we have dumped more than a couple batches of beer that we didn’t think were perfect. It’s hard to do, but it means a lot to us and our customers. Q: Did you guys expect to win? A: We have won 8 medals over the past 4 months from every competition we have entered including the US Beer Open Championship, Denver International Beer Competition, and Colorado State Fair. I wouldn’t say that we expected to win anything at the GABF, but we certainly had high hopes for our Kolsch and Imperial Porter. Those beers continue to do very well in competitions and on the market. However, when we were driving to Denver to set up on Thursday, we realized we entered the Imperial Porter into the wrong category. We entered it into 17a (other strong ale) instead of 17b (American Imperial Porter), we still aren’t sure how we screwed that up, but there is definitely a learning curve for first time GABF newbies like us when selecting categories. We are interested to see the judging notes on the Kolsch. The other two beers we entered were our Saison and the Peanut Butter Porter. Our Saison has wild flower honey and orange peels in it and is fermented with French Ale yeast. So does it belong in the Honey Beer, Saison, or Other French and Belgian Style categories? We are also excited to learn more from the judging sheets on the Saison so we can either fix recipe problems or choose a correct category for it. And the Peanut Butter Porter? In all honesty, that beer has already been judged by the general public as our most popular beer and we are moving fast to bottle it. An award would have of course been nice, but that beer is going to sell with or without an award. Q: I think you guys are in the running for crowd favorite for your Peanut Butter Porter – what do you think? A: LOL, maybe…There were a lot of popular beers out on the floor, but I think it’s safe to say that our Peanut Butter Porter was high up on quite a few peoples list(s). What started out as a Valentines Day collaboration beer with our good friend Justin Gold who owns Justin’s Nut Butter in Boulder, CO has now become our most popular beer. The base beer is our Imperial Porter, so the beer is starting out with a really solid foundation and the organic peanut butter helps to bring the chocolatey notes out of the porter. To further illuminate the Peanut Butter Porters popularity at the GABF, the organizers ask that each brewery bring two 1/6 barrel kegs of each beer to last the entire festival with 1oz. pours. We ran out of Peanut Butter Porter during the first session Thursday night. So Friday morning we drove back to our brewery and got an extra ½ barrel and ¼ barrel because we wanted people who paid good money for GABF tickets to have a sample of that beer if they wanted it. Those kegs managed to last most of the way through the Saturday night session. Next year we will bring even more of it. The popularity of the Peanut Butter Porter at GABF was great for us from a sales perspective because we aren’t just getting a ton of calls asking for our Altbier, but also for the Peanut Butter Porter. Q: Do you think we’ll see a medal for Peanut Butter Porter next year?